Patrick discovered Rachael, Christiana and David at the same time. He came across them, hanging around in Kasoa during the day and questioned why they were not in school. They explained it was because they could not pay school fees. Patrick left his number with the children and told them to have their parents call him. He waited a few weeks but never got a reply. He came across the children in the street again and instructed them to tell their parents he was the police and that he urgently needed to speak to them. The next day the phone rang. He was contacted by David's stepfather, Micheal Tetteh. After explaining his mission, Patrick asked him to bring the children to the school were they could be provided with an education without the fees. Micheal did not hesitate in agreeing and brought all three children to the foundation the next day. Rachael is the kind of girl that is deceivingly shy. She may initially come across quiet and reserved, but you may have just met her in the mornings. Once she has woken up and has a little energy around her she is the bubbliest, giddiest and funniest girl at the foundation. 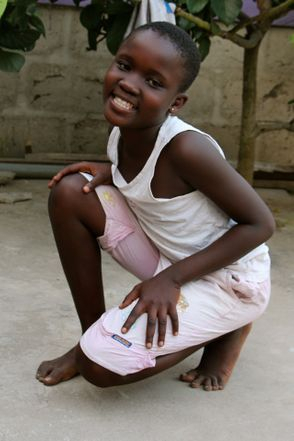 She is a fantastic dancer and can play Ampe, a girls rhythmic clapping game, for hours on end. She has a great singing voice and her favourite song is 'To God Be The Glory'. She likes to sing it with her best friend Grace and they will try and compete for who can sing louder. Her favourite colour is blue. Her favourite food is the Savior Children "Special"; jollof rice. When she grows up she says she wants to be a doctor.